My big kid will be going to the same summer camp he went to last summer and at that camp there is a time in the afternoon where they are allowed to take out their electronic devices and play. Many of the kids last year played minecraft. The big kid didn't have any electronic device of his own last year, but enjoyed watching the other kids play minecraft and played minecraft at home on my iPad. This past Christmas he got a tablet of his own, so I wanted to make him a case to protect it for when he takes it to summer camp. 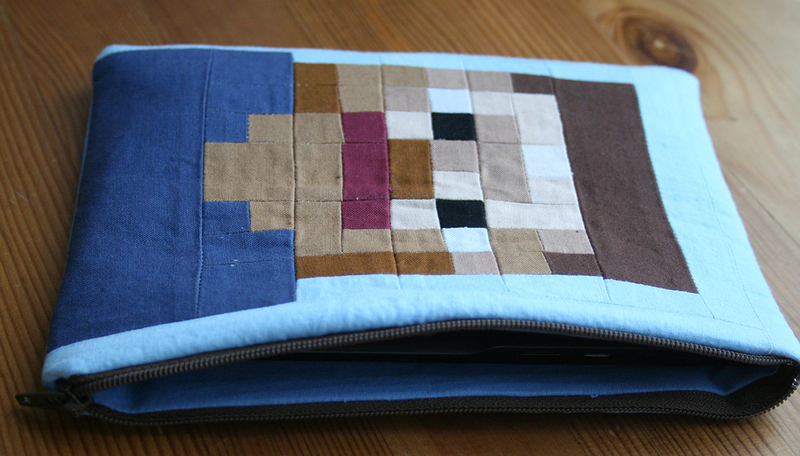 And since the main reason he wanted a tablet was to play minecraft, I figured I would make him a minecraft-themed case. I had the idea to make the front of the case be the face of the main character, Steve. I wanted to reproduce the pixelated look of the game by piecing together several different beiges, tans and browns for the face. 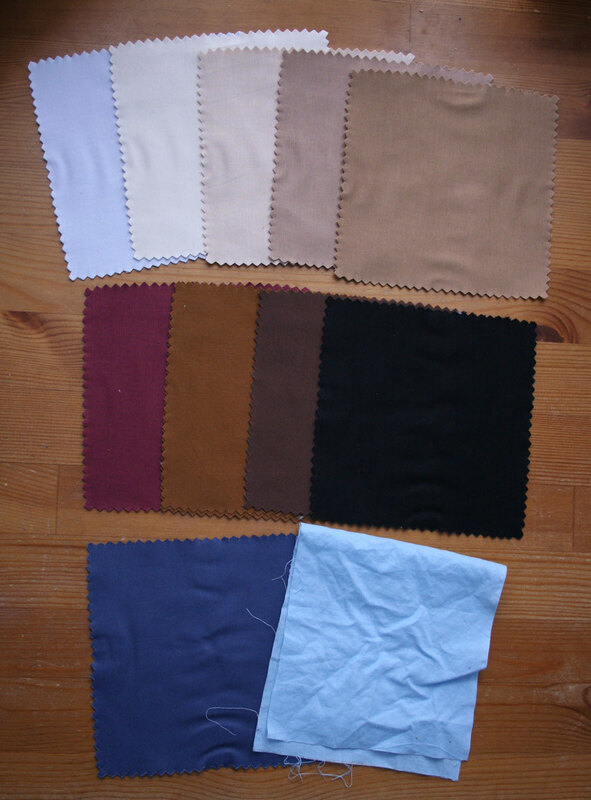 I bought a charm pack of neutral colors from Fabric.com and picked out the ones that most closely matched Steve's skin tones, hair and shirt. I just had to add a light blue for the sky background. I had recently watched the free Craftsy class, Pictures to Pixel Quilts (affilliate link), which goes through the steps for turning a picture into a pixel quilt. Although it is called a mini-class and is free, it is actually a full class with six lessons and almost two hours of instruction which teaches you everything you need to know to create a pixel quilt from your chosen picture. I used her method to make a chart for Steve's head. You can download my chart here. Because I wanted my case to be about 5" wide I made my squares 1/2" finished. 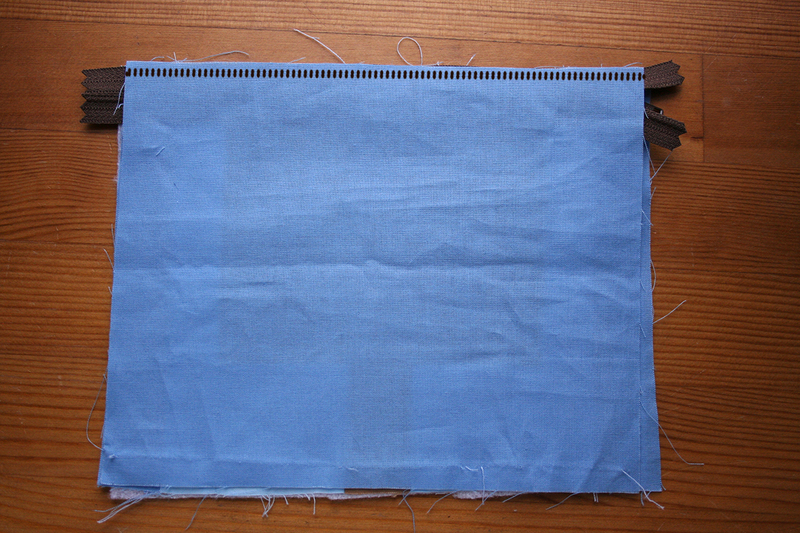 I used a 1/4" seam allowance, so to make the squares 1/2" when finished, I had to cut out a 1" square. When I could, I cut larger pieces. The top of Steve's hair, for example, is 8 squares wide by 2 squares high, so I cut a piece 4.5" x 1.5" (4" x 1" finished) for his hair and added 1" x 1.5" pieces of light blue onto each side. 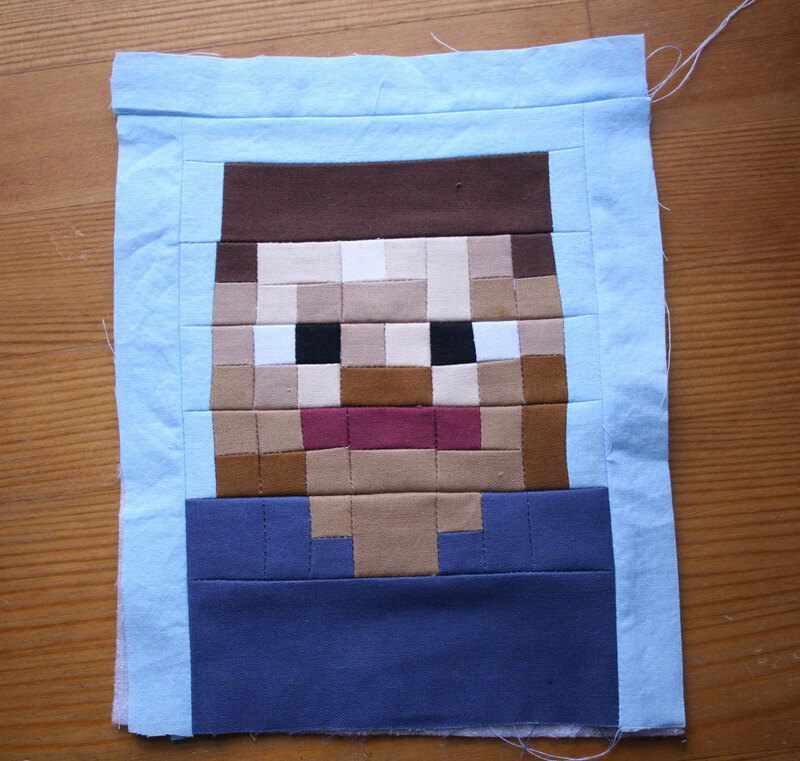 I mostly assembled Steve's face by making four-patches and then sewing those together into rows. I pressed my seams open. Once I had the whole picture of Steve assembled I measured it and realized I needed to make it a little bigger. I would recommend, if you want to make your own tablet case, that you make your front and back pieces about 2" longer and wider than your tablet., 1" will be for seam allowances in sewing the tablet case together and 1" will be for ease in getting the tablet in to the case. This is especially important on the side with the zipper because the zipper hardware is going to take up some of your opening space (I speak from experience here). If your child's tablet has significant thickness, you will need to account for that as well. To make my picture bigger I added a dark blue strip to the bottom and light blue strips to the sides and top. 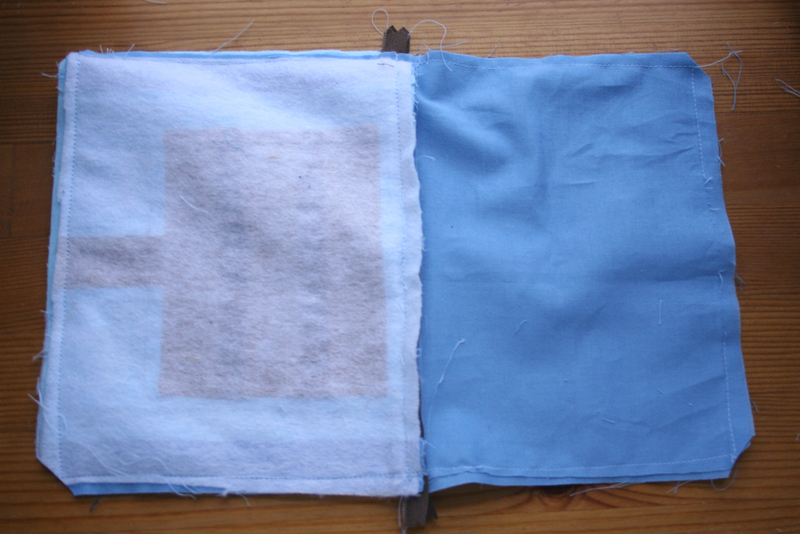 Once I had Steve the right size, I fused a piece of fusible fleece to the back. I think if I had to do it again though, I would just use a piece of batting. 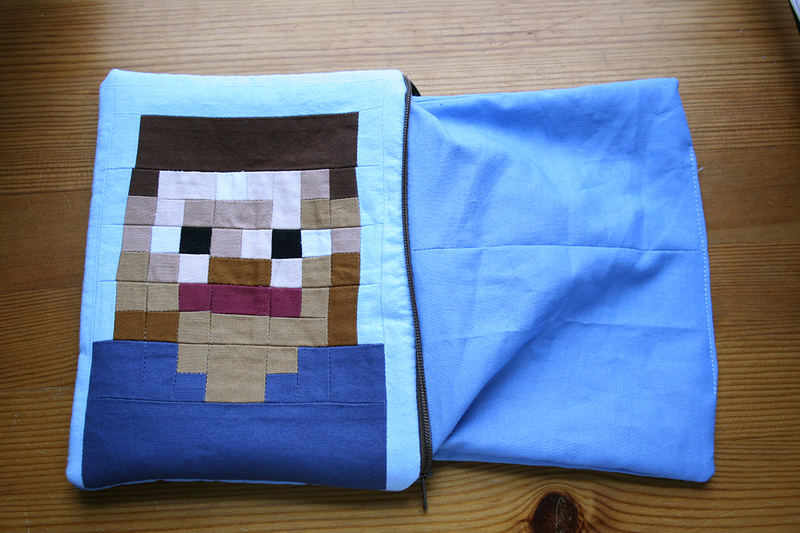 The fusible fleece made Steve a little pucker-y -- I think because of all the seams. For the back I decided to make a wooden sign like they have in minecraft. I basically sewed together three strips of a medium brown that were 5.5" x 1.5" with skinnier strips of darker brown in between (5.5" x 1"). 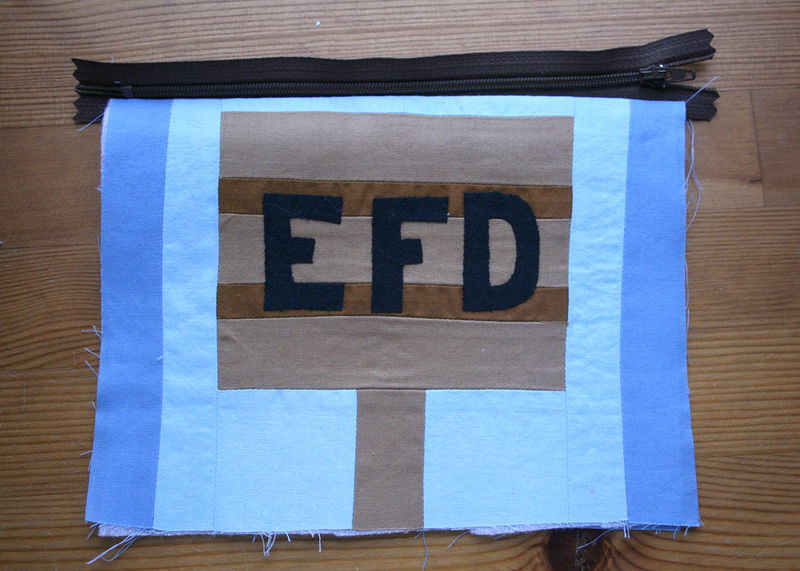 For the post of the sign I sewed a brown strip (1.5" wide) in between two blue strips (2.5" wide, I believe). Then I added blue strips around it to get it to the right size. As, you can see I ran out of my light blue and had to pull a medium blue out of my scraps to finish this up. I decided to put my big kid's initials on the sign. I cut out a piece of black knit fabric about 2" tall and 4" wide and fused wonder under onto the back of it. I drew the letters onto the wonder under (backwards - since that was going to be the back of the fabric) and then cut them out. 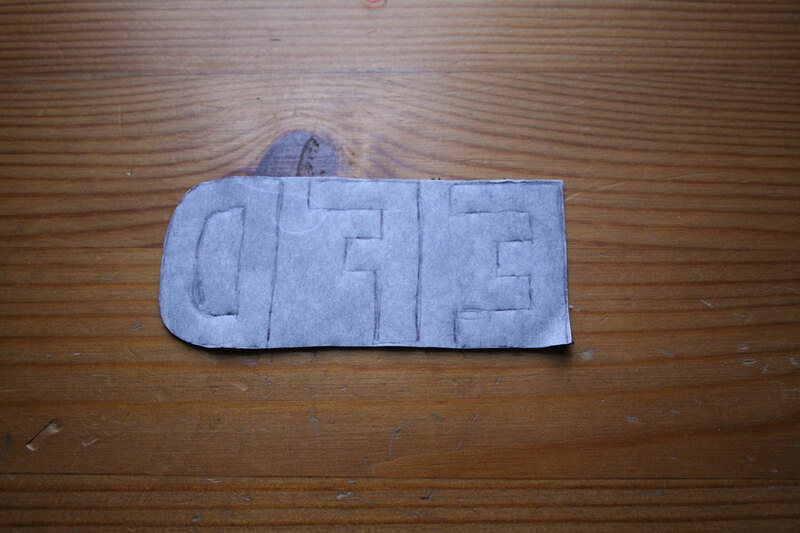 I then peeled the paper off and fused the letters onto the sign. 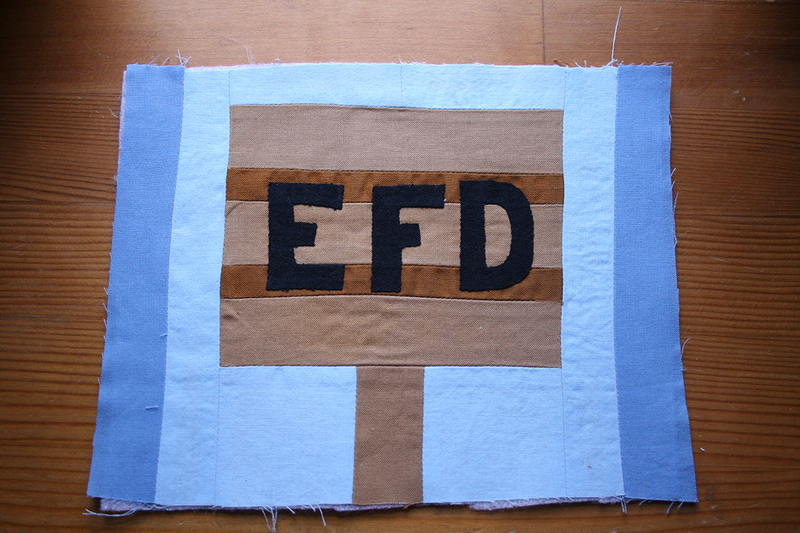 I also fused fusible fleece onto the back of the pieced sign. Now with front and back pieced, I just had to sew it up as a basic zipper pouch. I cut out two lining pieces the same size as the front and back pieces. I then lay the zipper face down on the back piece, lay a lining piece on top of that and sewed along the zipper with a zipper foot. I flipped the pieces back, away from the zipper. You can topstitch next to the zipper if you like. I then lay the other side of the zipper face down on the front piece, put a lining piee on top and sewed along the zipper again. 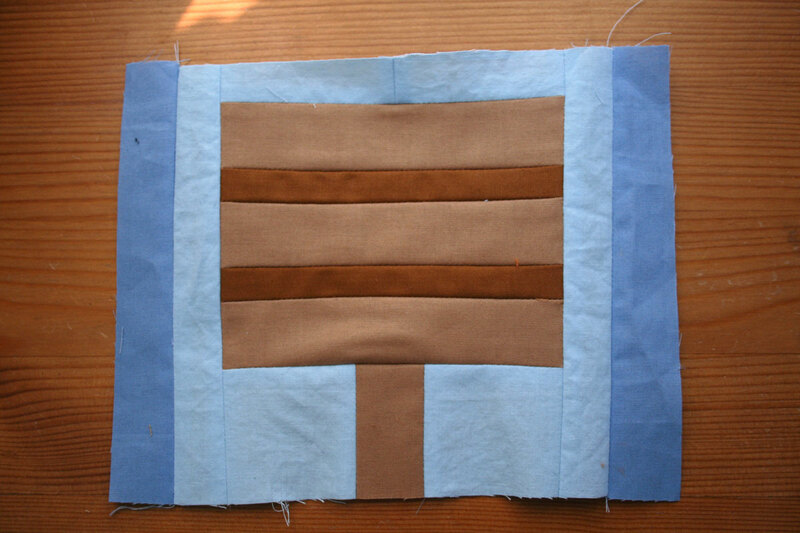 Flip pieces away from zipper and topstitch if you like. Then I arranged the two outer pieces so that they were right sides together and the two lining pieces so they were together and sewed around the outisde - leaving a 3" gap in the bottom of the lining piece for turning. I clipped the corners and then turned the case right side out through the opening. I sewed the gap closed with my machine (because I'm lazy and it's not really going to show). I stuffed the lining into the case and voila! 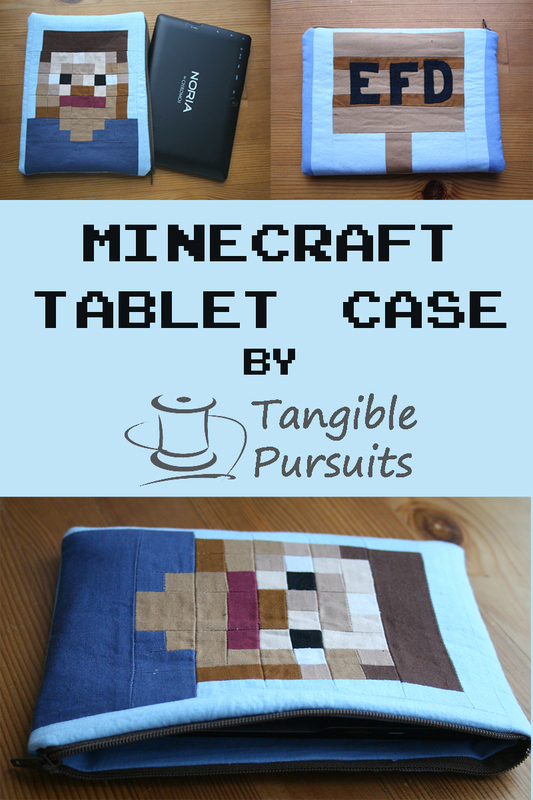 a cool tablet case for my big kid. 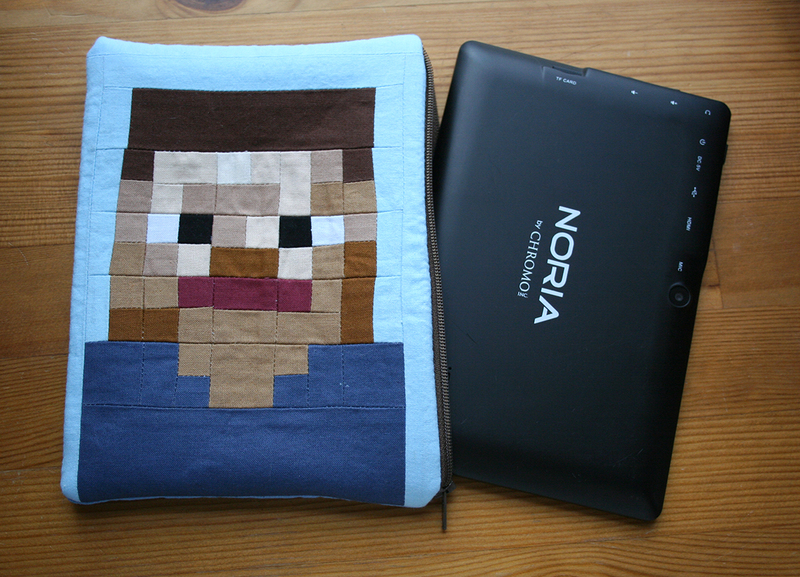 I'm just hoping the kids are still playing minecraft this summer! By the way, if you haven't yet, don't forget to enter the giveaway for a free copy of my fox lovey sewing pattern. You have until Sunday May 18 at 11:59pm EDT to enter! Wow, this is so detailed, nice work! Thanks for linking up with Tuesday Sews at PiePie Designs! Great case! Great explanation/tute. Thanks for linking up to Inspire Us Thursdays! That is such a fun idea - it turned out so nicely!